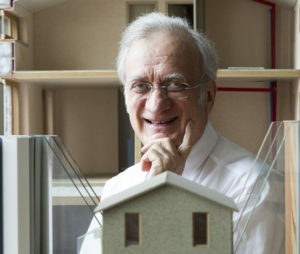 It’s been more than 25 years since Dr. Wolfgang Feist built the first Passive House building in Darmstadt, Germany. Katrin Krämer, press officer for the Passive House Institute, sat down with him to find out how it all began. 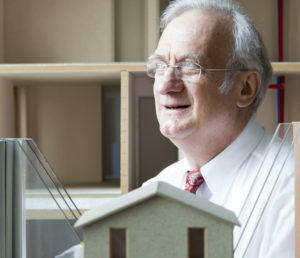 You were a Passive House pioneer 25 years ago when you built the world’s first Passive House. Do you still remember the spirit of optimism prevailing at the time? Of course! Those were turbulent times. People were concerned with things other than the future of the planet. It was the time when the so-called “real socialist” dictatorships were collapsing and energy policy was almost synonymous with nuclear energy policy. However, there were a few people who were actively concerned with the essential question as to why we needed to use so much energy. William Shurcliff, Arthur Rosenfeld, and Amory Lovins in the USA, Harold Orr in Canada, Vagn Korsgaard and Joergen Noergard in Denmark, Bo Adamson and Arne Elmroth in Sweden – the list goes on. Most of these pioneers came from different scientific disciplines and were committed to publicising the benefits of science among people. What motivated you to promote Passive House and alternative building concepts? Even as far back as the 1970s it was clear that the era of fossil fuels was coming to an end. It was clear that the main problem with this form of energy was the carbon dioxide emissions. However, during that time the focus was placed on substituting fossil fuels with nuclear alternatives. Only a few scientists, such as my friend Klaus Traube, had gone through the arduous process of correctly assessing the risks of energy from nuclear fission. Viewed objectively, it was clear that another substitution strategy for fossil energy was needed. We therefore decided to tackle the problem at its roots. We analysed what these vast amounts of fuel being extracted from the ground were actually being used for. The result was shocking: the largest single share of modern energy consumption was being used for heating buildings, that’s over one third! To those well-versed in physics, it was immediately clear that this could be done more efficiently; it was only a question of implementation. We therefore turned to the practical issues of heating systems, heat distribution, windows, roofs and ventilation systems. What did your family think about your plans for alternative construction at the time? Were they as enthusiastic as you? Both our children were still small and were excited about everything happening around them. My wife Witta, was a dedicated participant right from the start; after all, we completed most of the learning process together. The grandparents were a bit sceptical but had a positive attitute towards this “nonsense” – and supported us as much as they could. Of course we did have to go through the completely normal strains and stresses of a construction process. But the fact that we wanted to build it differently from the usual method didn’t make it any easier. Our architects Professor Bott, Ridder and Westermeyer were very supportive. They went along with almost all our wishes (only making fun of the stringently observed principles). The IWU (German Institute for Housing and the Environment) permitted the associated accompanying research and the Ministry of Economics of the State of Hesse provided funding. We buried hundreds of sensors in the individual components of the building. This was more complicated than today as wireless didn’t exist and hundreds of cables had to be correctly laid. You were one of four building owners committed to the construction of a Passive House as a private initiative. Who were the others? The city of Darmstadt allocated a construction site and there was a long list of applicants for the long lease plots. Families with a restricted income were eligible to apply for the building plots. The search for joint building owners still proved to be difficult. It was only when we finally gathered the courage to build ourselves and overcome our inhibitions that three families came forward who were ready to take part in this project. All of them had completely different professions and we didn’t know any of them previously. How did you manage disputes during the construction phase? Client support from Rasch & Partner and the architects played an important role here. They elegantly managed to steer around any obstacles. We knew these partners from previous projects in which they had always managed to counter-balance the centrifugal forces arising during joint construction projects. Our first prototype building had to convince everyone of the rationality of the respective solutions, and it did so. Of course, people ridiculed some of these things (in secret as well as openly). At the same time everyone was also curious to see whether it would work: a house that did not need any energy for heating. Did you simply divide the construction costs between the four families? For the standard version there was a dividing scale. Clients could order and pay for “extras”, such as a custom kitchen or a particular type of floor covering. Generally speaking, the four homes are identically structured, at least with regard to their structural quality. All are of a Passive House standard, even according to the current criteria. For the additional investment costs (still relevant at that time) amounting to about 90,000 Deutsche Marks per unit, the Ministry of Economic Affairs of the State of Hesse offered a subsidy of 50%. In those days energy was much cheaper than today. For such a research project, the direct economic efficiency of the prototype was not a key focus. It was more important to test whether the concept actually worked. It is the same with other technical developments: the first scientific pocket calculators used to cost about 2000 Deutsche Marks. After it became clear how they functioned and that they did function, it was possible to dramatically reduce their cost. Do the same families still live in your terraced housing complex today? One family rents out its housing unit. People have children and things change just like everywhere else in the world. Do you all still get on with each other? The co-owners have formed a partnership based on convenience. In the pilot project we attempted to offer joint use where this was beneficial, e.g. of the laundry room and the drying room. This idea came from Sweden where such facilities are quite common. To be honest, this wasn’t very successful in our case, probably because our societal trends are moving in the direction of more individualisation. Today, one is more likely to go and buy an electric drill rather than borrow one from the neighbours. Such trends also have an impact on these kinds of joint building ventures. You often open your terraced housing complex to the public and even today it is still the subject of many technical investigations. What is it like to live in such an ‘exhibit’ and ‘test object’? In the beginning we enjoyed it – in the first two years, we had about 5000 visitors in our homes. Eventually my wife and I felt that all the tidying up and cleaning was leading to a lot of stress, so we decided to limit it. We took care to ensure that the visitors did not notice the technology and measurements at all. We also ensured that the data was anonymised to respect the residents’ privacy. 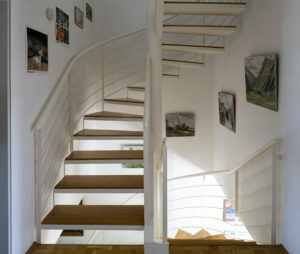 The Passive House stands in a tradition which has been evolving for centuries. For example, when you look at the specific values for heat loss from exterior building components, these have been gradually decreasing for more than a hundred years. They started at around 1.5 and have now reached about 0.15 (watts per square metre kelvin) with the Passive House, that’s one tenth of that. We had been following the developments in Scandinavia and North America with great interest. In fact, in 1980 Sweden already had a building code matching the German EnEV of today which many regard as particularly ‘efficient’ (7 litres heating oil per square metre per year). We had close contact with the scientists in Sweden and in the USA. Bo Adamson, my colleague in Sweden, worked on the project with me. 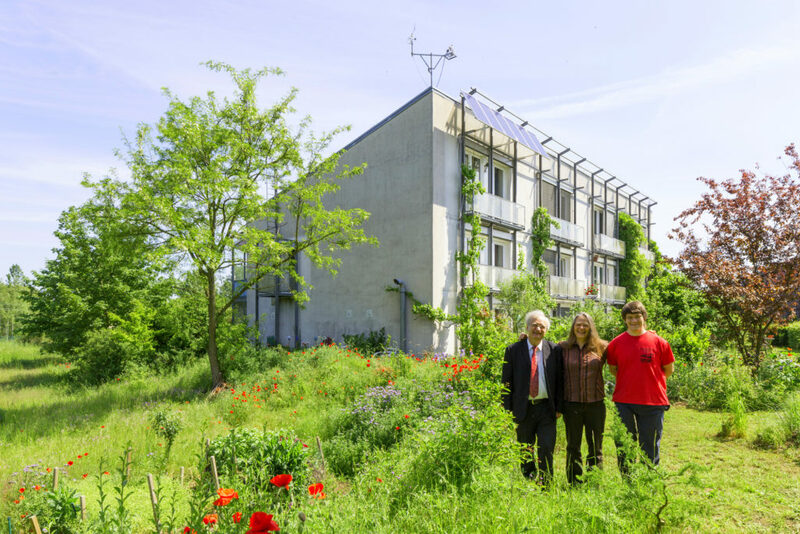 Why was the first Passive House built in Darmstadt? This was due to a number of coincidences, but also at the request of Günther Metzger, the mayor of the city at that time. The city already had a piece of land reserved for “experimental housing construction”, most of which had already been developed. 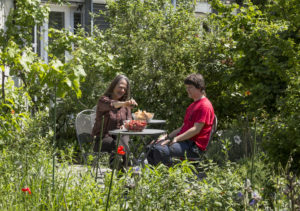 A research institute of the State of Hesse and the city of Darmstadt’s Institute for Housing and the Environment was responsible for a piece of land used for innovation. That’s where we were working, and due to this we had contacts at the international level where we discussed these ideas. The Passive House is a consequent further development of the low energy house. We reduced the unnecessary heat losses through walls, roofs and windows to the extent that a heating system became completely irrelevant. A Passive House building requires the equivalent of just 1.5 litres of heating oil per square metre per year. How did fellow experts and other building physicists react to your plans relating to the Passive House? Completely differently – My PhD supervisor had his reservations but had a positive attitude and closely followed the developments. Others – whose names I will not mention here – published theoretical papers explaining that such a concept would never function. How long did it take you to plan the Passive House concept in your mind and until the final decision to go ahead with the project? The basic idea arose from a talk with Bo Adamson that took place somewhere around 1987 in Lund, Sweden. He had just returned from a research trip to Southern China where he had been involved in improving the comfort of unheated houses. He referred to these houses as “passive houses”. This term is used because these buildings function as a passive system in thermal terms – and everything becomes much simpler, including the scientific analysis. We decided to strive for a research project in order to find out whether this might also work in Europe with its much colder winters. We were able to set up a ‘pre-construction research project for Passive Houses’. The team considered all conceivable variants – and in theory it actually seemed to work. We realised that a reliable procedure to depict the thermal behaviour of buildings was of decisive importance. How long did the architectural and technical planning last until the first cut of the spade and the first digger rolled along? The components which characterise a Passive House, e.g. triple-glazed windows, were not yet available on the market. How did you manage? If we look at the example of low-e triple glazing: yes, that wasn’t commercially available. I still remember the conversation I had in 1989 with Dr. Ortmanns who was the head of research at the large plate glass company Vegla (Saint Gobain today). “OK – three panes with a coating on 3 and 5 – good, we’ll supply them for this project”. It wasn’t always so easy and successful. For example, we couldn’t easily get the thermally separated spacers so easily. It was years before the industry recognised the opportunities in this field. Other times we had to make the necessary components ourselves – in the laboratory as it were. This was the case for the modification of the four central ventilation units which we equipped with specially developed direct current fans and a control unit for air quality. How did the joiner react when you asked him to create windows with triple panes of glass? Was he cooperative? Well, he refused to accept liability – it was just like it is today with innovations. The idea that most of the involved craftsmen did not agree with the innovations is simply a stereotypical claim. During the construction process, I personally experienced how we stood on ladders together and installed the airtight sheeting in accordance with the Passive House principles. We neatly applied the sheeting everywhere without any creases. The crafts trade has a long tradition in Germany and it is a huge advantage for this country to have so many highly competent small and medium-sized businesses on the market. The carpentry experts in particular responded very quickly to new developments and expanded their expertise and made substantially optimised solutions available. What would you do differently today, with regard to the construction of your Passive House? Today I would orient the pitched roof slightly towards the south, to make use of the more advanced photovoltaic technology. And I would obviously use the certified Passive House components which are available today. These components are almost 50% better than the solutions we constructed ourselves, particularly the windows. I would simplify the ventilation system further and I would use heat pumps for heating. But it would definitely be a Passive House again. That has proved most successful: constant fresh air, a permanently comfortable indoor climate, and negligible heating costs. What advice would you give to people who are interested in building a Passive House? What matters is the planning! You should perform a full PHPP (Passive House Planning Package) calculation and you should certify the planning. It won’t cost much, but it will ensure that everything functions as it ought to afterwards. Don’t let yourself be talked into expensive extras. All Passive House components are available at fair prices today. Investing in a well-planned Passive House isn’t much more expensive than investing in an ordinary house. Make sure that the ventilation system is simple and that you use a certified ventilation unit. For the sake of your health insist on high quality fresh air filters. Pay attention to the calculation of summer comfort in the PHPP. Summers will be hotter in future; a Passive House can be planned so that it stays at a comfortable temperature. You were a Passive House pioneer but today you teach energy efficient building construction at the University of Innsbruck. A lot has happened since then! My teaching work incorporates a basic course in physics among other things – after all, I am a physicist! That’s great fun with the students. Today, science forms the basis of our civilisation, which relies very heavily on technology; but science also has a cultural duty: understanding where we as humans fit into the overall picture in the cosmos. Where is mankind’s place in the cosmos? As the astrophysicist Carl Sagan once put it beautifully: “We are a way for the Cosmos to know itself”. We have a responsibility for this great development. It is our duty to treat the planet und our fellow humans with respect. You travel worldwide for the Passive House cause and are constantly on the move. Are you planning a small Passive House on the edge of a beautiful lake in order to settle down one day? Johann Wolfgang Goethe recognised and described the contradictory nature of the human soul. For me, fulfilment does not lie in passive relaxation, not at the moment. I derive pleasure from ever-increasing insight; I would like to have more time for that and it would be good to be less worn out by the daily grind. No, I’m not planning to retire from the hustle and bustle of life just yet. Innsbruck lies in the midst of high mountains – one can reach the top in a couple of hours. Up here, daily problems seem so small. A continuation of the process of self-realisation which Ernst Bloch describes so accurately in The Principle of Hope: “… which is why we become”. Humans have just started this process of self-discovery. We have made substantial progress since our first attempts at using fire, not only in technical terms but also culturally. We have realised that we are one species – with only slight differences from the Cape of Good Hope up to Alaska. We have triumphed over hunger and disease to a large extent and we should see it as our primary task to keep on improving at that. We have largely been able to bring peace to our daily lives – but we have not overcome wars. However, a humanity which still needs thousands of years for its cognitive process is dependent on international peace agreements. An understanding of the concerns and motivations of the people is the key to this. We must destroy the remaining nuclear weapons or place them under international control. The present generations must end dependence on fossil energy sources. We will then be able to advance the cognitive process, extend our life spans in dignity, multiply our possibilities for communication, exploit the solar system, and even travelling to distant stars will come within reach for coming generations. Are these wishes for the future sufficient? Well, some things cannot be grasped at present; Ernst Bloch was right when he said “…which is why we become”. 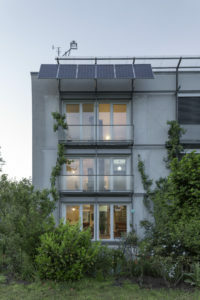 darmstadt, energy efficient, history, interview, passive house, sustainable, wolfgang feist. Bookmark. We have make a spanish and a Catalan translation. Hope you like and hel to spread the word too! Thank you for bring awareness to the world on the extreme need for Net Zero Plus homes in a world of Climate Change. Thanks for moving the world wide housing industry forward !!! Great article, and inspirational.